Image captured by NASA's Lunar Reconnaissance Orbiter showing the crater blasted out when the agency's LADEE spacecraft slammed into the moon on April 18, 2014. The image is actually a composite of two photos, one taken before the crash and one after; the bright spot highlights what changed between those two times. A NASA spacecraft has spotted the place where one of its brethren slammed into the surface of the moon six months ago. The agency's Lunar Reconnaissance Orbiter (LRO) photographed a new lunar crater that researchers say is the grave of NASA's LADEE probe, which ended its mission with an intentional crash onto the moon's surface on April 18, 2014. LADEE's grave lies about 0.5 miles (0.8 kilometers) from the eastern rim of the larger Sundman V crater, just 0.2 miles (0.3 km) north of the spot where mission team members predicted the spacecraft would go down based on tracking data, NASA officials said. Sundman V lies on the far side of the moon, away from the Apollo landing sites and other areas of historical importance. The crater gouged out when NASA's LADEE probe crashed intentionally into the moon on April 18, 2014 is visible as a small white smudge to the upper right of the large central crater in this image captured by the space agency's Lunar Reconnaissance Orbiter. "I'm happy that the LROC team was able to confirm the LADEE impact point," LADEE project manager Butler Hine, of NASA's Ames Research Center in Moffett Field, California, said in a statement. (LROC is the Lunar Reconnaissance Orbiter Camera aboard LRO, which captured the images). "It really helps the LADEE team to get closure and know exactly where the product of their hard work wound up." The new crater is less than 10 feet (3 meters) wide. It's so small because LADEE was just the size of a washing machine, and the probe was traveling relatively slowly (3,800 mph, or 6,116 km/h) when it impacted the surface,. 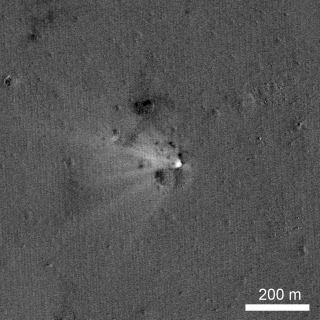 The LROC team was able to spot LADEE's impact crater after developing a new tool that compared before-and-after images of the same lunar sites, researchers said. The $280 million LADEE (Lunar Atmosphere and Dust Environment Explorer) mission launched in September, on a quest to study the moon's wispy atmosphere, known as an exosphere, and learn more about lunar dust. LADEE completed its mission successfully and was brought down intentionally in April because it was running out of fuel. LRO launched in September 2009 and recently received a two-year mission extension. "With LRO, NASA will study our nearest celestial neighbor for at least two more years," said LRO project scientist John Keller, of NASA’s Goddard Space Flight Center in Greenbelt, Maryland. "LRO continues to increase our understanding of the moon and its environment."